Making Steel Industry history in Sri Lanka, Ceylon Steel Corporation has entered in to the production of standardized “Flat Iron”. Among the welding technicians, “Flat Iron” is known as “Steel Plating”. 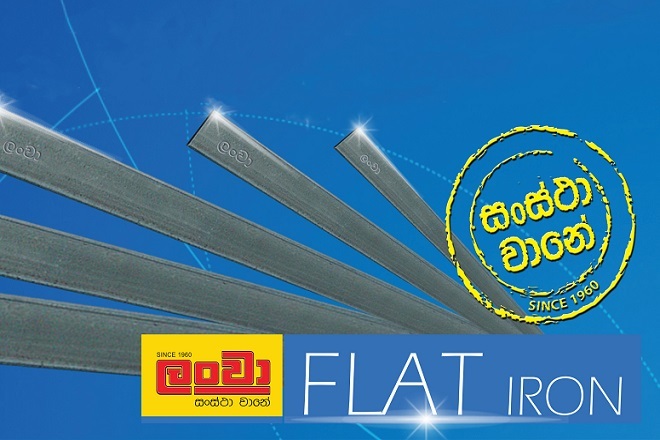 Ceylon Steel Corporation Ltd, the pioneer in Sri Lanka Steel Industry, presents standardized flat iron to the market, along with their experience and expertise, garnered over a period exceeding 60 years. It has to be said that, what we see mostly in the market today are products bereft of standards and products not mindful of proper length and width. Besides, their utilization of raw material is unmethodical. With this background, Ceylon Steel Corporation introduce flat iron to their cluster of products, with the expressed intention of providing customers a guaranteed standard at a fair price. This is with the brand name “Sanstha” which has won the trust of consumers over a period of 60 years. Through their three foremost qualities, namely unfurnished raw-materials, high product standards and reasonable pricing, the corporation will likely register a worldwide popularity through the production of “Lanwa Flat Iron”. This product, will be the prime choice in this category, primarily because of its high quality. This makes it an appropriate time to revisit the recent history and evaluation of steel production in Sri Lanka. The manufacture of steel is an area of industry that has produced giant organizations at global level. Many makers of steel on a colossal scale, dominate the world of industry, as their product “Steel” is an indispensable commodity for the building programs of the totality of mankind. “Steel”, being a high priority need for man’s culture of manufacture, the producers of this prime asset, have figured prominently in the lists of richest persons and organization in the world. In the specialized group of those prestigious steel makers in the world, we in Sri Lanka too possess a leader that has continued to be a trail-blazer un-yieldingly entrenched in the vanguard of this industry in this land. This undisputed leader is Ceylon Steel Corporation Ltd. The Corporation takes due pride in the highly significant role it has been able to play, by contributing substantially to the developmental effort of our country. The corporation is also known by its brand names “Lanwa Sanstha Wane” or “Sanstha wane”. In their unceasing preoccupation with the self-imposed compulsion to constantly upgrade their image, the Corporation is committed to the adoption of the state-of-the-art technological advancements and operational procedures of the most sophisticated quality. These elevated principles and distinguished standards are not only productive, but are, in addition, pro-actively environment friendly, enabling the Corporation to deliver steel solutions, to actively assist the nation’s developmental agendas. The Corporation was fully confident that they were totally and completely ready to dominate the burgeoning expectations of the ever-booming constructions industry, that was beginning to be over-crowded with mega construction programs. The Corporation was starkly aware that such a field could be met only with ultra- sophisticated technologies, and advanced professionals who were comprehensively adept in the latest techniques. The Corporation was profoundly aware that they must encounter the challenges posed, with steel-manufactures, who were attuned not only to what is happening, but also to what tomorrow will bring. The Corporation was equipped with the right formula. Their mantra was to the point: “when Lanwa delivers, it should not be just the nations steel-but we should deliver the nations mettle as well”. While facilitating all those who ensured the impressive progress of Ceylon Steel Corporation, it is essential to trace the evolution of this institution to its present status. Ceylon Steel Corporation was founded, way back in 1961. From then on, through a series of stages, the Corporation evolved steadily. The transfer of Ceylon Steel Corporation LTD to Hanjung (Korea) took place in December 1996. When we take a panoptic view of the highly impressive progress made by the Corporation, we cannot help but admire the exemplary leadership provided by the Chairman and owner of Ceylon Steel Corporation Nandana Jayadeva Lokuwithana. As Lokuwithana himself says, he takes a ‘Humble Pride’, in the tremendous progress the Corporation has been able to achieve. He took the helm at Ceylon Steel Corporation, and steered it into an era of unparalleled progress. Nandana Jayadewa Lokuwithana hails from Madawachchiya. According to him, he was raised in a modest background. But, when we take an objective view of the corporate triumphs he has been able to register, we become aware of his exceptional personality traits. Under his perpetually alert guidance, Ceylon Steel Corporation Ltd has achieved the status of the foremost Steel manufacturer. The Corporation has won the trust and confidence of a discerning clientele for its unassailable quality, standards and affordability. This trust will last for generations to come. To become fully aware of Lokuwithana’s exceptional entrepreneurial efficiency, we have to look beyond our shores too. Across the Indian ocean, in Sharjah, U.A.E, Lokuwithana established the Onyx Group in 2003. A brief listing of his ownership of companies based in UAE, under the umbrella of Onyx Group, will enable us to appreciate the enterprising aspect of his personality. While facilitating this outstanding Sri Lankan entrepreneurial genius, we are quite certain that he will ensure the success of the island’s development efforts, through his contributions in a variety of fields. His colorful personality is quite exemplary. Starting in the textile industry, his life and carreer become duly tempered in the UAE, where he distinguished himself in a range of enterprises. With his vast store of experience, he now adorns the industrial world of Sri Lanka.